The health care program provides health monitoring and protective supervision, personal care assistance and specialized therapeutic services to help seniors manage and overcome the effects of a Stroke, Parkinson’s disease, Arthritis, Diabetes, Alzheimer’s disease and other chronic health conditions that impact their activities of daily living and independence. Individual plans of care are developed through a partnership between the participants’ primary care physician, Center Registered Nurses and the family to ensure the overall health and well being of the participant. Specific medical supervision and daily care needs are identified for each participant. Our nurses keep caregivers and physicians informed of any changes in the condition of the participant and are always available to discuss care needs. 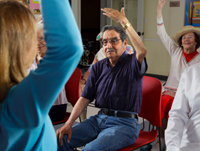 The Center’s rehabilitation program is specifically designed to improve the health, mobility, cognition and independence of our special needs seniors. Rehabilitation programs are individually designed based on medical diagnosis and work to improve core strength, balance and endurance to reduce the risk of falls; assist with activities of daily living; and improve communication and cognition. The Center offers a well-balanced breakfast, lunch and snack daily. Menus are designed by a Registered Dietitian and are prepared fresh daily on site. Diet consultations are also provided by a Registered Dietitian as needed. Mealtime assistance is available. Vegetarian lunch options are available. For special diet concerns, please contact our Social Worker. Accessible door-to-door transportation is available in the health care program. Transportation options may vary, please contact our Social Worker for more information. Irvine Adult Day Health Services operates its programs and services without regard to race, color, and national origin in accordance with Title VI of the Civil Rights Act. For more information on IADHS Civil Rights Program, contact our Program Director and Civil Rights Coordinator Hollis Parmely at (949) 262-1123 or hparmely@irvineadhs.org. The Center charges a daily fee for service for both the social day program and the health care program. Prices vary according to each program. The health care program fee structure includes Private Pay, Medi-Cal, and long term care insurance as available. IADHS is at capacity for the Community Based Adult Services (CBAS) program for Medi-Cal beneficiaries. Please inquire directly with our Social Workers at (949) 262-1123 to learn about the waiting list and enrollment process. Scholarship Assistance may be available following an application and review process. For more information about the Center, our Services or to schedule a tour of the facility, please call one of our Social Workers Jill Upton or Michaelann Cassady at (949) 262-1123 or email them at jupton@irvineadhs.org or mcassady@irvineadhs.org.